Double attack happens when two pieces attack two different pieces at the same time. One of the attacks is usually a discovered attack, and the piece that moves to do the discovered attack also makes an attack. It also happens when you attack one of the opponent’s pieces, he counterattacks one of your pieces, and then you move your attacked piece to attack another one of his pieces. 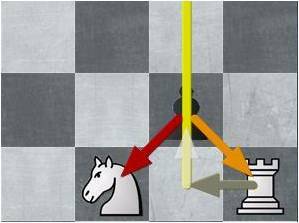 To find double attack, look for two pieces that can attack two of the opponent’s pieces at the same time. With two pieces under attack, the opponent may not be able to save both. Double check happens when two pieces put the king in check at the same time. One of the checks is a discovered check, and the piece that moves to do the discovered check also puts the king in check. It is similar to discovered check. When the king is in double check, there are not three ways to get out of check. There is only one way out. The king must move to get out of double check. You cannot block to get out of double check because you cannot block two pieces at the same time. You cannot capture to get out of double check because you cannot capture two pieces at the same time. You must move the king to get out of double check. To find double check, look for discovered check, where the piece that moves also puts the king in check. 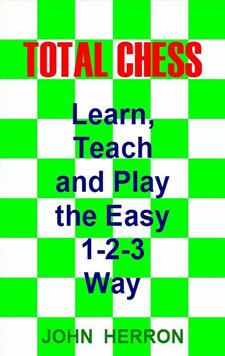 Double check is a very powerful tactic that sometimes leads to checkmate. Double threat happens when one piece makes two threats at the same time. It is similar to a fork tactic. With a fork tactic, one piece attacks two pieces at the same time. With double threat, one piece makes two threats at the same time. While the opponent is busy defending one threat, you take advantage of the other threat. He usually cannot defend both. The two threats may be captures, checks, tactical threats, checkmate threats, positional threats, or any other threats that give you an advantage. To find double threat, look for one piece that can make two threats at the same time. Double threat is very similar to a fork tactic, except instead of attacking two pieces, at least one of the attacks is some other kind of threat. Very interesting article, way to go Mr. Herron! I love the double check idea. It’s just awesome .. ..